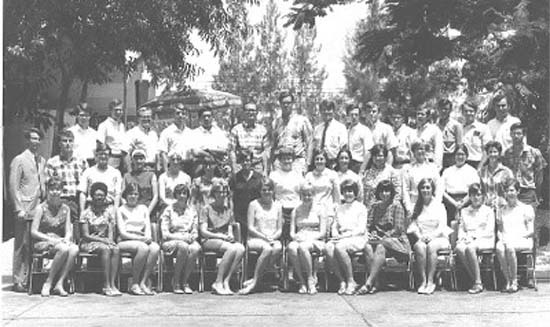 Caption: Group photo of Thailand 24 Volunteers taken in Bangkok in August 1968. Members of Thailand 24 were instrumental in organizing the RPCV ad that appeared in the New York Times on February 21. The author of this article, Collin Tong, is in the top row, fifth from the left. SEATTLE - Although the idea for the RPCV ad campaign first surfaced last fall, my involvement with Iraq began about 12 years ago. During the U.S. military buildup leading up to the first Gulf War in January 1991, my former Seattle church had voted to become a sanctuary church for conscientious objectors. In the years following the Gulf War, I became friends with an Iraqi-American colleague at work and with his family in Seattle. As a result, over the years I was to learn much about his country and the growing humanitarian crisis there. I eventually joined two Seattle-based peace organizations, Citizens Concerned for the People of Iraq (CCPI) and the Interfaith Network of Concern (INOC). INOC, Washington Physicians for Social Responsibility (WPSR), and Voices in the Wilderness delegations have made numerous trips to Iraq bringing medical supplies to hospitals in Basra and around Baghdad. 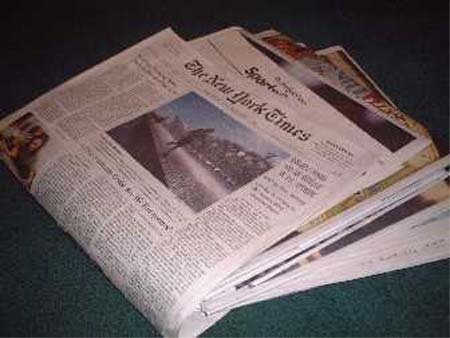 The events leading up to the decision to initiate the New York Times ad campaign, however, began on Aug. 13 when former UN Deputy Secretary General Dr. Hans Von Sponeck spoke in Seattle. His trip coincided with the return of U.S. Rep. Jim McDermott (D-Wash.) and several members of our church from Iraq. Von Sponeck (and his predecessor Denis Halliday) had served as UN Humanitarian Coordinator for Iraq and resigned in protest over the economic sanctions. Since the economic sanctions began, an estimated 500,000 Iraqi children under the age of five have died as a result of the sanctions - almost three times as many as the number of Japanese killed during the U.S. atomic bomb attacks. I subsequently organized an Oct. 5 press conference for Scott Ritter, former UN chief weapons inspector in Iraq. During his Seattle visit, Ritter (whom I first met in May 2001) asserted that "there is no justification in fact, national security, international law, or basic morality to justify this coming war with Iraq." Ritter led the first UN Special Commission (UNSCOM) weapons inspection team in Iraq that dismantled 95 percent of the country's arsenal of biological, chemical, and nuclear weapons. He resigned from UNSCOM in protest in 1998 because of manipulation of the inspection protocol by U.S. intelligence officials. Ritter and Von Sponeck's Seattle visit had a powerful effect on me, recalling Dr. Martin Luther King Jr.'s famous 1967 speech at New York's Riverside Church: "There comes a time when silence is betrayal." I was further reminded of President John F. Kennedy's speech at American University on June 10, 1963: "What kind of peace do we seek? Not a Pax Americana enforced on the world by American weapons of war. Not the peace of the grave or the security of the slave. I am talking about genuine peace, the kind of peace that makes life on earth worth living, the kind that enables men and nations to grow and to hope and to build a better life for their children -- not merely peace for Americans but peace for all men and women -- not merely peace in our time but peace for all time." It was at Christmas, however, during a visit with my Seattle Iraqi-American friends that the reality of a war with Iraq finally hit home in a personal way. My wife, Linda, and I saw photos of their parents, uncles, aunts, nieces and nephews, and other relatives in Baghdad. It was then that the idea of running a full-page ad in the New York Times of RPCVs was born. I had heard of similar plans to run ads by MoveOn and other national peace organizations. CCPI and INOC already were putting signs for Seattle buses - a campaign headed by Howard Gayle - with a compelling photo of three young Iraqi girls in the Al Jumiraya neighborhood of Basra, taken by Dr. Bob Haynes (a Seattle physician) during a trip to Iraq in May 2000 with his wife Gerri, WPSR president. 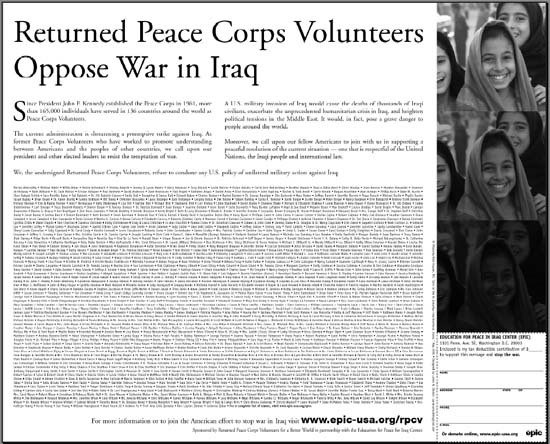 The thought of a New York Times ad signed by Returned Peace Corps Volunteers with Bob Haynes' photo took hold. On Sunday, Jan. 12, after sharing the idea with Peace Corps Thailand 24 friends by e-mail, I called Sam Brown Jr., former ACTION/ Peace Corps director for President Jimmy Carter, in Washington D.C. to get his thoughts. Sam, my former college classmate at the University of Redlands, in California, had organized the 1969 Vietnam Moratorium, after I returned from Peace Corps service in Thailand. It was important, Sam told me, to enlist broad-based RPCV participation from across the country. He also suggested setting up an online web-site for donations to raise funds for the ad. With the help of Andrew Fung, a Boeing engineer, and Jeff Gustafson, a Microsoft web designer in Seattle (both CCPI - INOC colleagues), I learned of the Education for Peace for Iraq Center (EPIC), a nonprofit organization in Washington D.C. that does advocacy work on Capitol Hill for a variety of humanitarian initiatives in Iraq. Jeff's brother, Erik Gustafson EPIC's executive director, and I decided to form a partnership whereby EPIC would host the web-site, monitor and record donations to the campaign, design the ad, and provide an online communications link with RPCVs nationwide. Next came the task of drafting the statement for the ad. What began as a 250-word statement on Tuesday, Jan. 14 was eventually condensed into five short paragraphs - thanks to the editorial suggestions of several Thailand RPCV friends - Jim Stifter, John Grima, Sandra Mitchell, Laura Wyckoff, Jacqueline Butler-Diaz, Karen Beatty, Scott McNabb, and Ted Chase. With Andrew Fung's technical assistance, the prototype for the web-site was up and running by Thursday, Jan. 16. I then contacted John Gordon and Steph Jesperson of the New York Times advertising department and learned that a full-page ad would cost $127,000 - our original target deadline was the day of the State of the Union address. Because of the prohibitive cost, we decided to run a standby ad for $40,000 instead. With the launch of the web-site, the campaign began in earnest on Jan. 17th. The biggest hurdle was contacting RPCVs around the country and reaching our fundraising target in time to pay for the ad. Time was running short, and each day brought news of the rapid forward deployment of U.S. troops and weaponry in the Persian Gulf region. Through our RPCV networks and National Peace Corps Association contacts, my Thailand 24 colleagues and I began to get the word out. Donations slowly trickled in as word of the campaign began to spread. I enlisted the aid of Dwight Wilson (RPCV Honduras and Chile), president of World Corps, Frederick Noland (RPCV Iran), founder of Ploughshares, Kevin Delany (my former Peace Corps Thailand country director), Thomas Schotzko (RPCV Thailand) and Cliff Moore (RPCV Togo) - both colleagues at Washington State University where I work - and friends at the National Peace Corps Association. Karen Beatty, Ted Chase, Scott McNabb, Leilani Widdison-Rigby, Robin Velte, Susan Walsh, Ann Morgan (my deputy director in Thailand, who later became director) and other Thailand 24 friends began calling their friends around the country. By Jan. 29, we had only raised about $7,500 toward our goal. Suddenly the thought of doing a $40,000 full-page ad seemed daunting. On Jan. 30, we decided to revise our strategy and aim for a more realistic target - i.e. a half-page standby ad at $23,700. Fortunately through the RPCV grapevine, I heard from an Ethiopia RPCV, John Coyne, who edits the Peace Corps Writers magazine and Peace Corps Online. Peace Corps Online ran a story on Feb. 3 about our campaign to 30,000 RPCVs, and donations began to pour in from around the country. The response was overwhelming - by Feb. 4 we reached our goal for the first ad. Lynn Fredriksson and James Decker at EPIC began the layout for the ad, which we submitted to the New York Times on Feb. 17th. Because word of our campaign was reaching a much broader audience, we decided we needed a second ad to accommodate all the names of all the RPCVs who wanted to join. On Friday, Feb. 21, the first half-page ad, "Returned Peace Corps Volunteers Oppose War in Iraq," ran in the National section of the New York Times on page A23. To date, more than 1,450 RPCVs and friends of Peace Corps have generously donated to the ad and more continue to sign our statement. On the day the ad ran, NPCA President Dane Smith pledged his support and Anne E. Baker, NPCA director of global education and technology, sent out a message to RPCVs encouraging them to join the campaign. John Reinke (RPCV Philippines and Nigeria) is working with us now on a media outreach campaign coinciding with the publication of both ads to ensure that more Americans know of our opposition to war with Iraq. Our second, half-page New York Times ad will run shortly after March 1st. Collin Tong, a Seattle-based writer, is senior director of news and westside communications at Washington State University. The current administration is threatening a preemptive strike against Iraq, the first in our nation�s history. As former Peace Corps Volunteers who have worked to promote understanding between Americans and the peoples of other countries, we call upon our president and other elected leaders to resist the temptation of war. In his June 10, 1963 speech at American University, President Kennedy said: "What kind of peace do we seek? Not a Pax Americana enforced on the world by American weapons of war. Not the peace of the grave or the security of the slave. I am talking about genuine peace, the kind of peace that makes life on earth worth living, the kind that enables men and nations to grow and to hope and to build a better life for their children -- not merely peace for Americans but peace for all men and women -- not merely peace in our time but peace for all time." A U.S. military invasion of Iraq would cause the deaths of thousands of Iraqi civilians, put more than one million children at risk of dying from malnutrition, and heighten political tensions in the Middle East. It would, in fact, pose a grave danger to people around the globe. As one of the contributors and signers of this first NY Times ad, I was very pleased to talk to Collin at a Peace Corps Day function last week. His energy, quick action, and yet unassuming manner are truly impressive and we are lucky to have someone like him (and someone with so many media and other connections) among us. Let's all get behind this movement to let this administration know that there are thousands and thousands of us who have lived abroad in harmony with other cultures who as a result oppose this shameful war. Please add my name to any future action against the Iraq war madness. No group of RPCVs should be allowed to use the RPCV name to support a personal or political agenda. This group should use their entire name. Diversity of opinion exists within the RPCV ranks. Not all of us are against this war. Where were you so called protesters on Sept 11. 2001????!!!! It really bugs the ---- out of me to have someone using what I thought was a good organization to prosalitize such an emotional issue. Why don't you just leave well enough alone & get out of the way!!!! Given your misguided way of thinking you might as well offer yourselves as human shields against Hamas, the rebel terrorists in Columbia or any criminal after having organized murder & mayhem. I strongly support the statements by RPCVs oposing the war on IRAQ, and I encourage others to join this campaign. I also encourage others to come up with alternative solutions which solve the root causes of terrorism--e.g.poverty. Contact me at alberts@engr.colostate.edu for my solution, and send me your solution. I want to thank Mr. Miguel Gomez for his honesty (message posted Wednesday, March 05, 2003 - 06:02 pm). "Of course, nobody WANTS war, blah, blah, blah, blah, blah, blah...."
Mr. Gomez WANTS war and so does the Bush Administration. Mr. Gomez is just more honest than President Bush and his Administration. There is, to be sure, a great diversity of opinion regarding Iraq and regarding the current Administration in general. Be that as it may, one thing is perfectly clear: it is positively disturbing to see a former Peace Corps Volunteer (such as Miguel Gomez, Bolivia 7) so bluntly advocating a pro-war stance. As an individual who has experienced the effects of war firsthand ~ during my service in El Salvador as a U.S. Peace Corps Volunteer ~ I can say that to actively pursue war is not only a diplomatic failure, but a crime against all of humanity. In a global society where no country may rightly call itself distinct and seperate from any other in the larger scheme of things, it is increasingly important that all nations and all governments learn (and quickly) the appropriate balance between the pursuit of an international presence as a diplomatic or economic excercise and the search for political and military control to meet strategic ends. Most countries ~ particularly the most powerful ones ~ have fallen on one side or another of this equation, drastically polarizing their positions in global society, and sacrificing equity normally garnered from consensus in favor of homogeneity and concentration of power. The end result has been that increasingly, both majority and minority sectors of society in all countries are marginalized by greater powers and nations. The absence of dialogue, and the pursuit of absolute power, is not only a sin against humanity and a dark spot on the soul of the very human race; it is a condition which leads to the inevitable result of an increase in conflict: Conflict feeds on conflict; one war is used as "justification" for another, and in the end, all parties lose. Nobody wins this game. We have seen our political leaders shake hands with Saddam Hussein in the eighties, and their assistance to him lead to a violent and extremist form of dictatorship. For 1,300 years a religious war has fueled conflict between Sunni and Shia Muslims in Iraq. By taking sides in this conflict, we can never make needed steps toward democratic reform, if such reform is indeed possible in Iraq at this point in history. We have seen our political leaders provide North Korea with radioactive materials in the mid-nineties that since have been transformed into nuclear weapons-grade stock. Now we are at the table with North Koreans, attempting to avert a catastrophe of our own making that could spark World War III. In the post-World War II history of the world, there has not been even one instance in which a country which was bombed by the United States of America has since emerged as a democratic state. America needs a new definition of national security, a PROACTIVE rather than REACTIVE definition; a PREVENTATIVE rather than PRE-EMPTIVE approach; not based on how many people we bomb or how many countries we control, but rather, based upon how many friends we can make, and with how many countries we have peaceful relations. This concept of national security in fact has been put into practice by a small but growing sector of U.S. society: Peace Corps Volunteers. of peace do we seek?" and women not merely peace in our time but peace for all time." diversity, for in the final analysis, our most basic common link is that we all inhabit this small planet, we all breathe the same air. We all cherish our children's future. And we are all mortal." This message is for Collin Tong. We met at the NPCA meeting in Portland and I forgot to get contact info from you. Please e-mail me at richs85@yahoo.com. I wish to discuss my third goal project proposal I presented in Portland. It was time to break the strangle hold the Sunnis have had on Iraq and facilitate freedom for the Kurds and Shias. It will not be easy or quick, but the brave beginning is at hand. Ricki Erik's "GOT PEACE? " Radio Tour is heating up the music charts with the latest release of his controversial single titled " IF I WAS GOD" due at mainstream radio on August 15th, 2006. We are promoting a "GOT PEACE?" Radio Tour campaign we'd like you to know about. Please let us know if you are interested in new opportunities with us or can offer an interview to the artist.